First and foremost, a big huge thank you to everyone who pinned and shared Friday’s post. I figured people would dig the pumpkin and cinnamon (and of course, the rum) but the response well exceeded my expectations. I shared on Facebook that I am blown away by the positive response and that is still true. I blog because I love it and because I believe the way to the heart is through the stomach, so seeing such a positive response to a post I already love gives me the warm fuzzies. Thanks everyone! And hello to new readers! Today’s post comes from a picture I stumbled on this weekend. It some how fell through the cracks after I uploaded the photos and it’s a real shame because it was one of my favorite grilled meals this summer. If you’re one of those people that thinks cilantro tastes like soap (how?? it’s so yummy!) then it’s probably not for you. If not, then hurry outside and make this before grilling season is over! 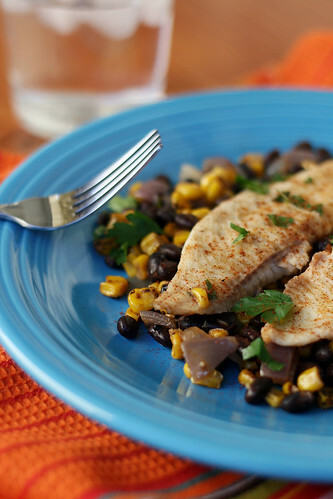 This recipe is perfect for people that are new to fish because swordfish is such a sturdy fish that it acts a lot like chicken. 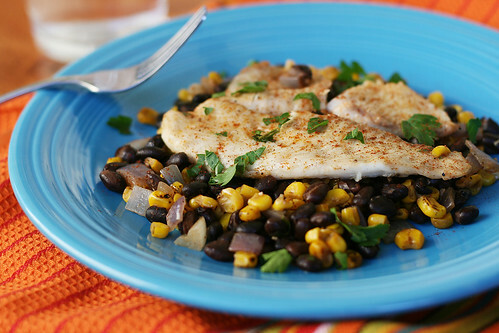 Plus the flavorful punch from the stuffing makes the fish taste even more subtle. Some may prefer a simpler preparation, and I can appreciate that, but I also have a hard time saying no to Pepper Jack cheese and cilantro! To the bowl of a food processor, add the garlic cloves and pulse for 10 seconds. Add the parsley, cilantro, lemon juice, cumin, cayenne pepper, and salt and pulse again until herbs are finely chopped. With the motor running, stream the olive oil and process until emulsified. Remove a 1/4 cup of mixture and set aside for later use. To the bowl add the grated Pepper Jack cheese and process for 15 seconds (it will look kind of crumbly, and that’s ok). Prepare a grill by lightly brushing the grates with oil and turning the flame to medium. 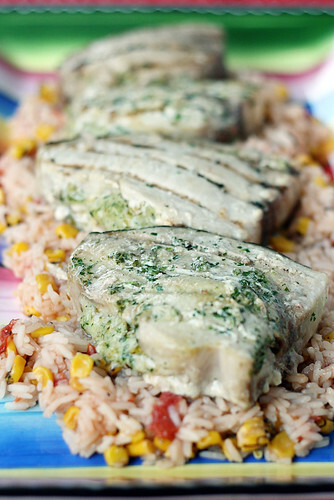 Prepare the swordfish steaks but slicing a horizontal pocket into the side of the fish. Sprinkle the outside with salt and pepper, then stuff each pocket with the Pepper Jack-Cilantro mixture. You can secure the pocket with a toothpick if you feel it is necessary. Grill the swordfish for 4-5 minutes then, using a metal spatula, carefully flip to the other side. 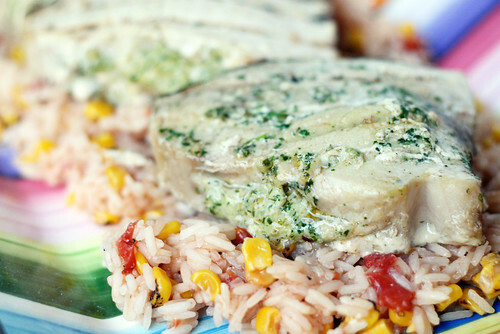 Brush each swordfish steak with the reserved cilantro mixture and grill for 4-5 minutes, or until the fish begins to easily flake. If you opt to use lemon halves, you can grill those for the final 4-5 minutes. Serve immediately with any additional cilantro sauce. Goes well with Spanish rice. Every once in a while I like what I call a “kid meal”. For lunch, that will mean a peanut butter and jelly with carrot sticks, a juice box, and fruit snacks. (Are people supposed to outgrow PB&J? Because I sure haven’t yet.) For dinner, it’s something like this meal. Fish sticks, macaroni and cheese, and green beans. But this isn’t your blue box and yellow wearing fisherman kind of “kid meal”. What’s really awesome though, is that it doesn’t take that much more time. You can’t tell me that takes much longer than the boxed meal. And of course, making it all yourself means knowing exactly what (and how much) is going into your food. 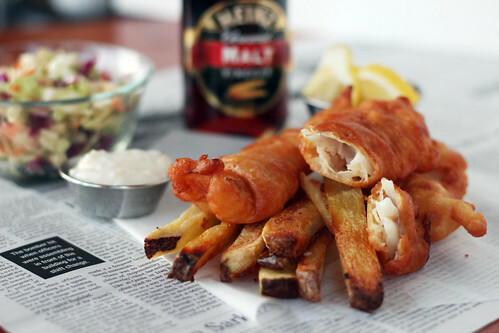 I also think that these fish sticks are well worth any extra effort. 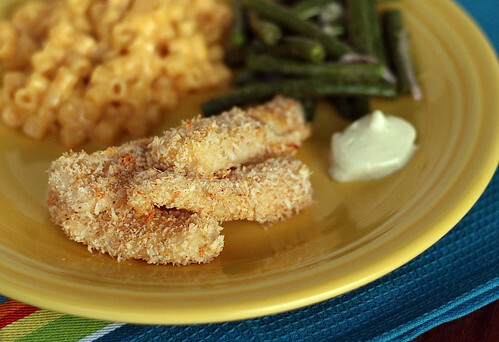 The panko really adds a nice crunch and there is no freezer burn after taste. Preheat oven to 450. Prepare a baking sheet by placing a wire (cooling) rack over the tray and lightly spraying with non-stick spray. 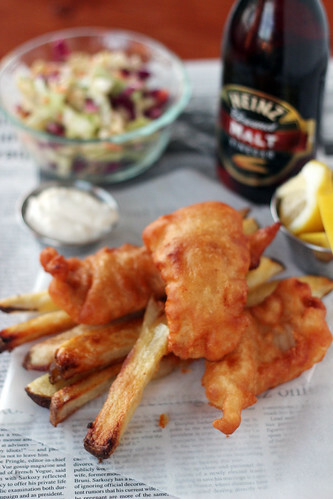 Cut the fish into strips. In a shallow bowl, mix together the panko, garlic powder, paprika, salt and pepper, and canola oil. Place the egg in separate bowl. Coat the fish sticks by dipping the strips into the egg first, then the panko mixture. Place the coated strips on the wire rack and bake for about 10 minutes, or until fish flakes easily, rotating pan halfway through. Have you ever tried Wasabi Mayonnaise? I bought some at Trader Joes and it was AWESOME with the fish sticks!